Dr. Berner is an Board Certified Orthospinologist. He conducts a thorough examination utilizing the latest technology, and addresses issues using very light force adjustments. 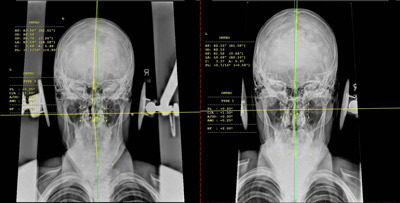 This approach uses an extremely precise 3 dimensional x-ray analysis to correct small misalignments of the first cervical vertebra, also known as the atlas. These misalignments, also known as subluxations, can cause neurological interferences to the brainstem and spinal cord. In addition, subluxations can often cause the body’s center of gravity to be off center, causing postural distortions that can affect the body globally and cause symptoms elsewhere. Study’s have shown that palpating or simply “feeling” the spine are neither accurate nor valid when it comes to spinal motion. Often times lower areas of the spine will become “locked” in a certain position. By using specific video x-ray analysis we can pinpoint the exact location of these locks and apply the proper adjustment to correct them. This technology takes the guesswork out of evaluating the spinal motion. In addition, we utilize specific x-ray filters and techniques to decrease radiation exposure levels over 80% compared to plain film. The best part is the patient can very clearly see when the spinal motion returns to normal. You can see these changes too! Check out these results. Dr. Berner uses extremely light force adjustment with no cracking or popping of the spine. By directing a light force, down a specific vector, a mechanical advantage is gained by using the weight of the head to gain leverage. It works in the same way that allows you to carry hundreds of pounds in a wheel barrel with little effort.